He then said I am going to pray for you. He said a prayer that turned out to be very interesting because usually, as you know, he doesn’t pray for long. So, when the crash happened, immediately it dawned on me that the Lord God had led him to say that very special prayer. And the Lord God Almighty delivered us in accordance with His word that “even when 10,000 falls by our side, no harm whatsoever, will come near us.” I just want to thank the Almighty God for His grace and mercy that has been so abundant in my life and in all of our lives who are here. 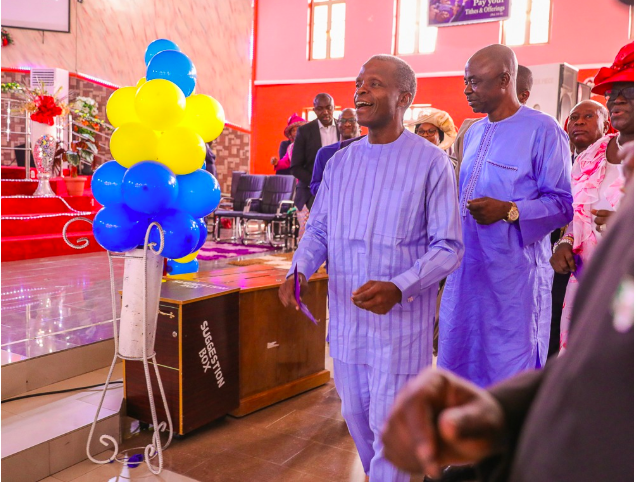 They are Labour Minister, Stephen Ocheni; & Mr Femi Osinbajo, VP’S elder brother. He also called the names of Senator Babafemi Ojudu, Special Adviser; & Ambassador Abdullahi Gwary, SSA Foreign Affairs/Protocol – although both of them were not in the service. Others are Mr Laolu Akande, the VP’s Spokesman; Dr Biodun Adelowo, Personal Physician; Mr Doyin Adetuberu, Security Officer; and Ayoola Oladunni, ADC).